This stunning resort is located on a beautiful area on the south of the São Miguel Island. The perfect place for a peaceful and relaxing getaway whilst giving you easy access to great dive spots. Hotel Do Canal is located on the Horta ocean-front offering comfort, great service and breath-taking panoramic views over the town bay and Pico Mountain. An archipelago that features 9 islands and a sea of emotions waiting to be discovered. The most remote islands in the Atlantic, just a few hours from the UK offering a huge variety of dive sites and experiences including close up encounters with sharks, rays and much more. After spending 9 days diving around the Azores Archipelago it is very safe to say that it has been some of the best European diving we have done so far. From exciting dives with Blue sharks to majestic encounters with Manta Rays and dramatic swim throughs along the islands’ coast, the Azores really is a very special diving destination. A stratovolcano named Mount Pico located on the Mid-Atlantic Ridge, Pico Island, Azores. The Azores is considered one of the world’s top locations for whale watching with the Sperm Whale being its most iconic image. Divers venturing to this beautiful archipelago discover that these islands with mild waters and incredible visibility hide some of the best underwater adventures in Europe. 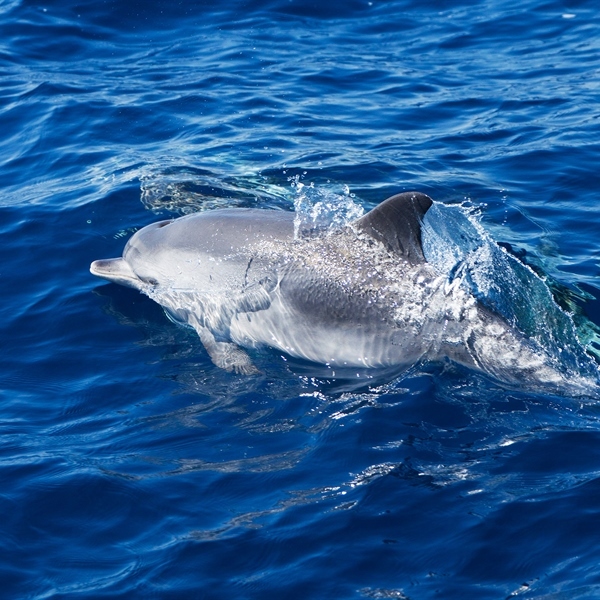 Located in the North Atlantic Ocean in transition zone with the nutrient rich currents from the north and the warm waters of the Gulf Stream, the Azores is a true sanctuary for a large and varied number of marine species. If you are looking for a diving holiday coupled with tranquility and breathtaking landscapes then the Azores is the place to visit. This Portuguese archipelago comprises of 9 islands, each offering unique experiences and landscapes surrounded by the vast and beautiful blue sea. Besides mild waters, the Azores has diverse underwater landscapes featuring coastal dives with volcanic seafloors inhabited by a variety of species, wreck dives and cave diving. 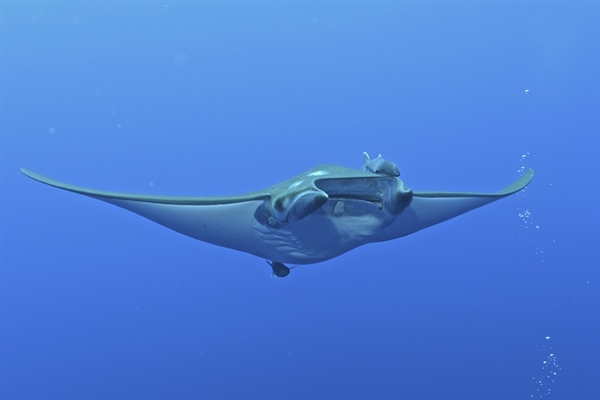 Diving with pelagic fish is one of the most paradigmatic dives in the Azores offering encounters with dozens of beautiful devil rays as well as large schools of fish on remote seamounts. The underwater experiences on each island are as different as the islands uphill adventures. On one island, Santa Maria you will have the pleasure of diving with whale sharks in pristine clear waters. On Faial Island you will come up close and personal with blue sharks and devil rays, and if shipwreck diving is your thing then that can also be found on the shores of another Azorean Island, the beautiful island of Sao Miguel. Depending on the island of your choice, your days and evenings can be as busy or as relaxed as you like. After extensive research and travel through the islands, Ultimate Diving has selected different experiences across 3 islands including Santa Maria, Sao Miguel and Faial. Santa Maria, also known as the “Island of the Sun” is the smallest and southernmost Azorean Island. 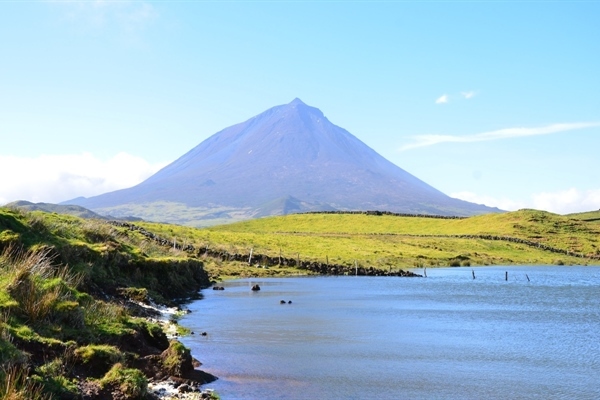 This island has become very popular amongst divers who visit the Azores for encounters with the colossus of the sea, the whale shark which is often escorted by thousands of tuna as well as pilot fish and numerous small fish. Schools of mobula rays are also common during the warmer summer months. This is a spectacular dive that allows experienced and new divers to see these majestic animals. Santa Maria is the only Azorean Island with a white sandy beach, something really rare in the archipelago but what’s not scarce are dive sites, with 55 surrounding the island’s including caves, passages and walls. In the evenings, you can choose to stay in your hotel and just relax after a hard day’s diving or go out to one of the two restaurants on the most famous beach in the Azores, “Praia Formosa”. If you are visiting the island in August and enjoy a good music festival then you are in for a massive treat. “Mare de Agosto” is the oldest music festival of the Azores and during 4 days in August, thousands of people get together on the bay to enjoy live concerts and other cultural activities. The costs per day in resort will depend on your daily choices. You can eat out in one of Santa Maria’s eateries from as little as EUR6 depending on what you choose to eat. A one course meal with a drink will cost between EUR20 to EUR30 for 2 people. The Natural Reserve of Formigas is considered one of the best diving locations in Europe. The reserve is located 20 miles northeast of Santa Maria Island and consists of 8 low lying rocks that rise above the water, an area that is locally known for unique dives and close encounters with pelagic species. There are a number of dive sites around the rocks including the wreck of “Olympia” on the southwestern side and “The Wall” on the northern tip of the rocks with large schools of pelagic and passages of manta rays. Dollabarat Bank is approximately 3 miles southeast of the Natural Reserve of Formigas and you can observe a great diversity of species, some of which are declining in other parts of the Atlantic. Baixa Dos Badejos also known as Grouper Reef is 40 minutes from coast with the top of the reef at a depth of 16 metres on a vertical wall that drops down to 35 metres. This site is famous for the countless numbers of groupers that can be seen here. The presence of strong currents also attracts a vast number of yellow mouth barracudas and Almaco jacks. 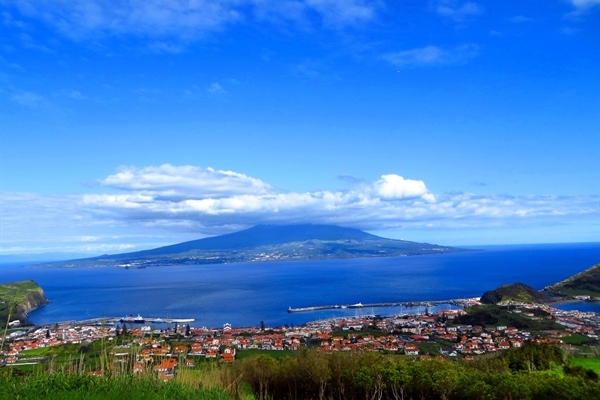 Faial is famous for the underwater volcanic craters surrounded by hundreds of fish, whale watching tours and off course home to one of the ocean’s fastest fish, the blue shark. Faial has wonderful coastal dives where you will be taken on an adventure to see yellow flowers like anemones with colourful blennies, puffer fish, jacks, sun fish, mackerels, sharks and manta rays. The channel between Faial and Pico Island has a few seamounts and very distinct dives. 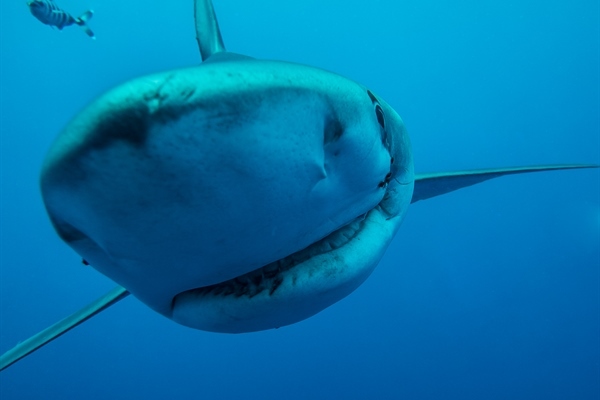 This is also where in addition to “Condor Seamount” located about 20 miles south of Faial Island; the adrenaline-fuelled shark dive takes place. Manta rays and other pelagic fish are also a common sight on “Princess Alice Bank” , located 45 miles southwest of Faial. Whale watching is a trip you do not want to miss out on. 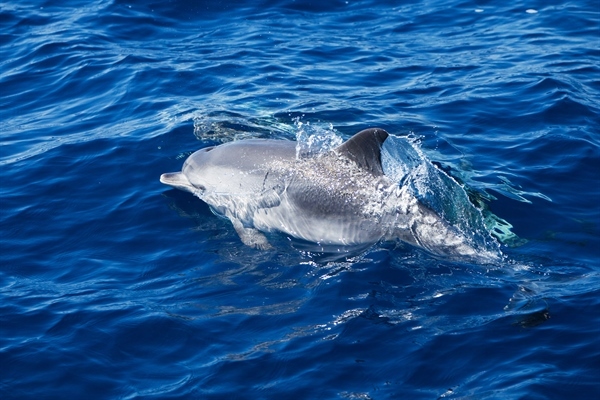 The Azores and in particular Faial Island have over 24 species of local and migrating blue whales and dolphins and if you have a non-diving partner, this may just be the place they decide to become divers. Faial Island and its main Harbour “Horta” is one of the most famous ports of call in Portugal with the legendary Peter’s Sport Café right by the bay. The area is a cosmopolitan meeting point for all walks of life, here you may come across sailors, technicians and even secret agents as well as enjoying a range of excellent and affordable food with prices ranging between EUR10 and EUR15 per meal. Horta is by nature a relatively calm place and it is reflected on its nightlife. However, here you will find a fair number of excellent places where you can relax and enjoy the best part of the day. In the evenings, if you are looking for a livelier environment, there are a couple of clubs and pubs open till late. Princess Alice Bank is one of the most famous seamounts in the archipelago. Here you will spot groups of devil rays and thousands of pelagic fish in a unique and incredible setting with 30 metres plus visibility. This seamount is located 5 to 6 hours away from Faial Island and is only visited by divers on a day trip with 2 dives at an extra charge. Dusky groupers, round stingrays, moray eels and hogfish patrol the seafloor but it is the life found near the surface that attracts divers here and make it a legendary dive with groups of dozens of graceful devil rays making their way through schools of barracuda, skipjack tuna, trevallies and other fish. Condor Seamount located 20 miles south of Faial Island offers one of the most intensive experiences a diver can enjoy in the area. 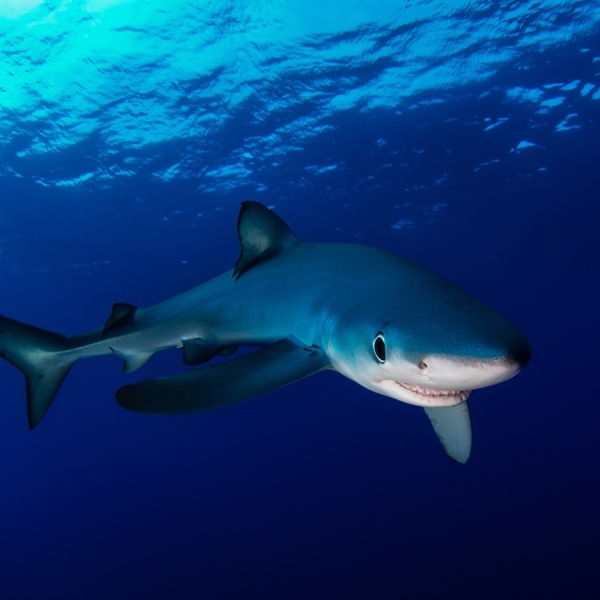 Here you will have the opportunity to dive in “open sea” with blue sharks. On a typical dive you can expect to see between 5 and 15 extremely curious predators moving slowly among divers and around the boat. 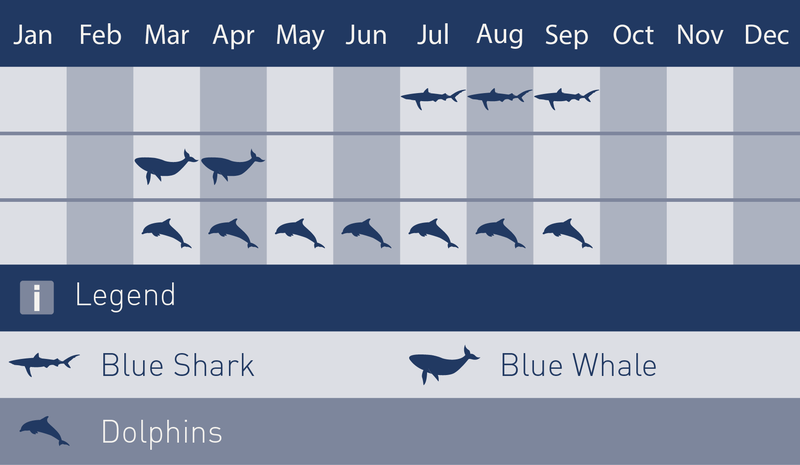 Please note this dive may involve long waiting periods at the surface while the blue sharks make their way from the deep and far away waters. Boca das Caldeirinhas is considered to be one of the best coastal dives of Faial and gets its name from the opening of the volcanic crater of Guia Hill which connects to the sea in the south. The interior of the crater is a protected area with restricted access leading to an abundance of life along the border area where the dive takes place. Sao Miguel Island, also known as the “Green Island” and the biggest of the Azores archipelago has a huge variety of places to visit above and below water. Being the land of crater lakes, Sao Miguel has places like “Sete Cidades Lake” steeped in myth and legend on the west side of the island and the “Furnas Lake” with beautiful hot springs and natural hot water pools on the east side of the island among many other places of interest. Underwater, there is an adventure waiting for new and experienced divers with a good number of dive sites easily accessed from shore including marine reserves, rocky reefs, underwater caves, arches, wrecks and seamounts with crystal clear and an abundance of rich marine life including pelagic fish, devil rays and sharks. 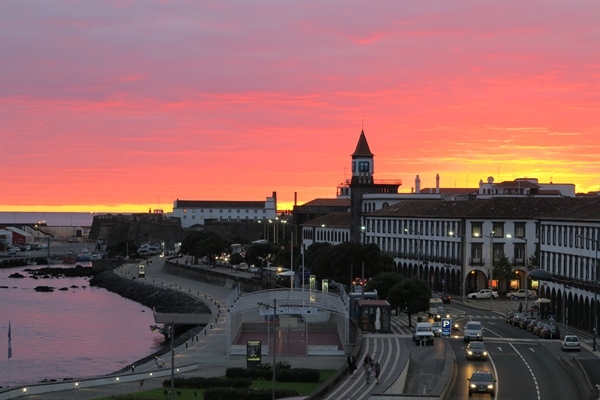 The island’s most cosmopolitan town, “Ponta Delgada” offers a blend of contemporary life with a historic flavor of monuments, turn of the century architecture, parks and cobble stone streets interlaced with a modern marina, nice restaurants, shopping, bars, night clubs, and oceanfront cafes. The average cost of eating out in local eateries and restaurants ranges from as little as EUR8 to EUR50 depending on what you choose to eat and where you choose to go. In the evenings, the new marina is a great place to spend a few hours. Boasting a liner terminal with an inter-island ferry and a 5300m² commercial zone with a number of restaurants, live music bars, a bank, travel agency, car rental and other amenities. Dori is a WWII shipwreck located 5 minutes from Ponta Delgada. Part of the “Operation Overload”, Dori found its final resting place many years later in the calm waters close to the Sao Miguel. This 130 metre long ship was one of more than 2750 Liberty Ships built in the United States during the WWII to provide assistance to allies across the Atlantic and it is now one of the most popular dive sites in the Azores. A dive on this true oasis of life will give you the opportunity to see small species of fish as well as large schools of barracuda and jacks. Amora is also located to the south coast of Sao Miguel Island and unlike other diving spots, Amora is characterised by the absence of rock formations and instead it features quite large pebbles over a seabed of sand with barred hogfishes, Ballan wrasses and Mediterranean parrot fish. Cabecos do Ilheu is a dive site for experienced divers as there are strong currents and parts of the dive are quite deep. There are four reefs in this area, all of them offering excellent opportunities for technical dives. This site is popular because it is less than one mile from the Vila Franca do Campo Islet, a place with opportunities to spot demersal species. British citizens do not require a visa for a stay of up 21 days. A 6 month valid passport is required. Our packages include transfers on arrival and departure day. On arrival you will be met by one of our representatives and transferred to the resort. Check Hotel pages for transfer times. 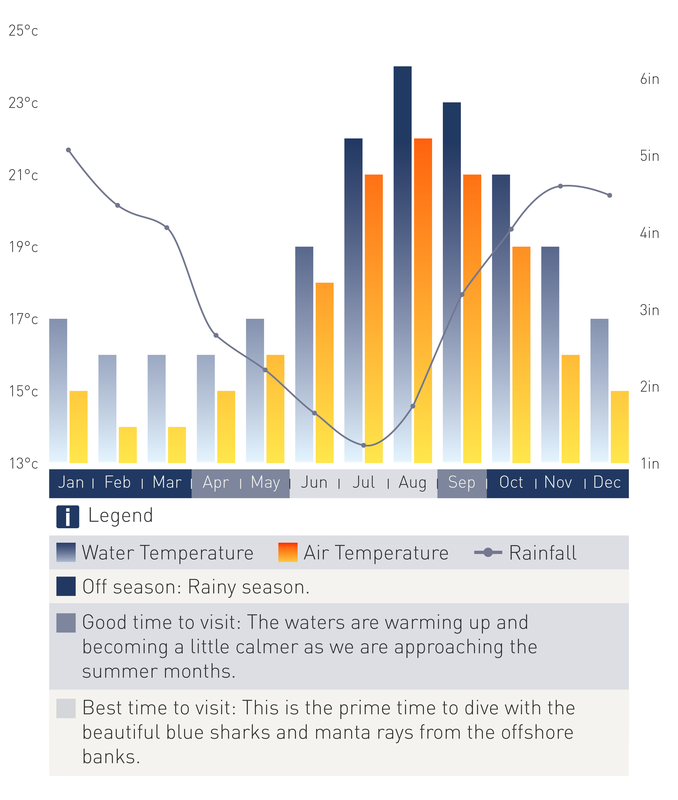 The diving season runs from the beginning of May till September with the best months being June, July and August as the better weather will give you the opportunity to visit more than one of the off shore banks during a 7 night holiday.